ALEGRIA DE VIVIR: Are You Ready for 2009 commitment? Are you ready to make your 2009 commitment to a life of joy, wholeness, fulfillment, and abundance? It is often said that we change who we are by changing our behavior; and we change our behavior by creating ritual. One of the reasons why ritual is so effective in effecting change is that it can lead to an innocent transformation – we are able to take small steps, make small shifts, in the smallest of increments, and very quickly our new world unfolds. The foundation of this change is commitment – our ability to amass our individual, collective, and universal intentions to truly create the life we desire. Without personal commitment we bounce through life like a cork on a raging river, having very little say over our direction, speed, or location. However, when we make personal commitments, the process allows us to more readily align our personal truth with universal truth. More importantly, making personal commitments allows the universe and the Self to more easily merge into one. This week at The Chopra Center, we are launching our commitment to make 2009 the most amazing year of our lives, beginning with our first event of the New Year – our SynchroDestiny self-empowerment workshop. Deepak and David will teach our 100 participants how to tap into our deepest potential to fulfill our desires and intentions – in essence . . . our destiny. Each of us does indeed make a profound difference in this world. And if we make a personal commitment to be the change we want to see, we can move from being "on-the-verge-of," to actually "witnessing" a golden era – one of peace, vitality, love, and purpose. This Namasté celebrates commitment in our own actions, and whether you believe your commitment is for the self or the universe, selfish or altruistic, personal or global, simply taking the small step today to commit to one thing within your sphere of influence can change the world forever. As you read this, think of just one commitment (not two, or three), just one that you would like to make to bring yourself closer to love or truth or peace or divine consciousness. Close your eyes right now and feel what your heart wants for you in the upcoming days, weeks, and months. Every yearning is significant. Maybe you want to commit to some aspect of your physical health, to having more fun, to becoming more loving to yourself and others. It’s important to be as specific as you can, so that it is clear what you are committing to. For example: I commit to going for a 20-minute walk after lunch three times a week or I commit to learning to meditate or I commit to going to bed before midnight or I commit to the practice of loving, conscious communication. The next step is to write your commitment. The written word is a powerful tool, and the act of putting your commitment on paper (or computer) strengthens your intention and resolve. Another way to magnify the force of your commitment is to share it with others. We invite you to share your commitment with the Namasté community by clicking here. Your commitment for 2009 will be listed on the special commitment page as we did last year. Each time someone visits the page, your commitment will become more tangible and powerful. You will be linking your commitments to millions of people around the world and transforming the world as you transform yourself. After you’ve written your commitment online at chopra.com, dedicate this day to sharing that commitment with ten other people before you go to bed. You can forward them your commitment page, you can email or text them, you can call them up, or you can tell them in person. 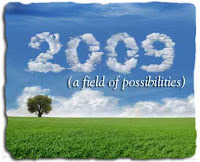 But most importantly, make it tangible by entering it on the page that can be your very first step to an amazing 2009. This Namasté offers some great inspiration on making commitments and even greater motivation for living your life with grace and ease. We have included your favorite features, including a delicious Ayurvedic recipe, a meditation Q&A, and letters from Deepak and David. We invite you to take a few quiet moments for yourself . . . to read, reflect, and plant your seeds of intention for the New Year.